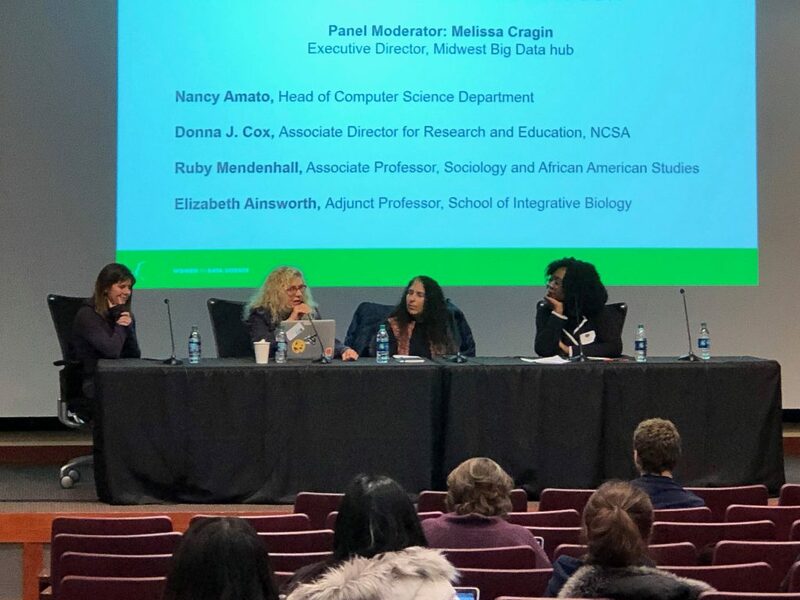 The Midwest Big Data Hub co-led local participation in the 4th annual Global Women in Data Science (WiDS) Conference, with sponsorship from the National Center for Supercomputing Applications (NCSA) and the University of Illinois. The event was free and open to all. The WiDS Conference, hosted on March 4th at 150 locations around the world, seeks to unite and connect women working in data science fields. 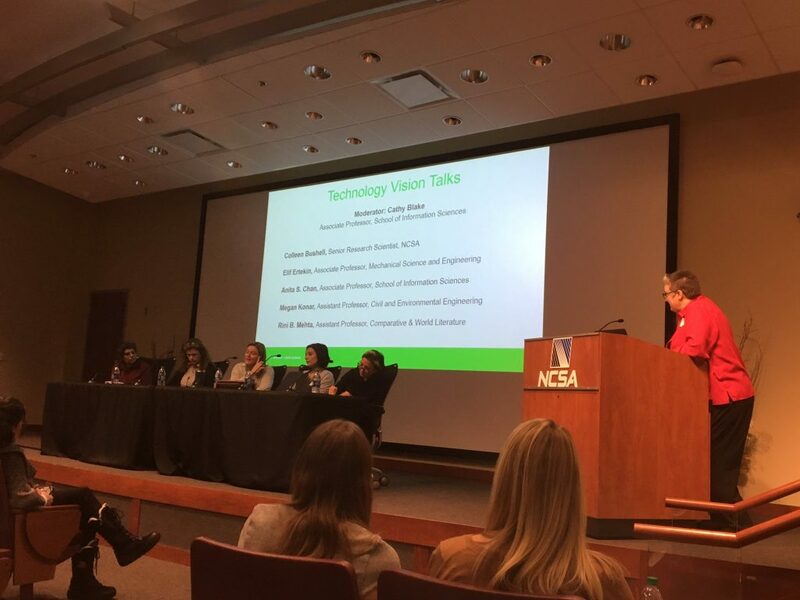 The WiDS local events, hosted this year at NCSA, featured a variety of speakers from diverse backgrounds presenting sessions on opportunities for women in data science, technical vision talks, and the variety of data science and technology careers available in the Midwest. As part of her 2017-2018 NCSA Faculty Fellowship, Mendenhall and NCSA research programmer Kiel Gilleade completed a pilot study called the Chicago Stress Study that examines how the exposure to nearby gun crimes impacted African American mothers living in Englewood, Chicago. Mendenhall and Gilleade developed a mobile health study which used wearable biosensors to document 12 women’s lived experiences for one month last fall. As part of their research, Mendenhall, Gilleade, and their team were able to create an exhibit based on the study data they collected in order to bring the unheard, day-to-day stories of these mothers to life. There are also opportunities to expand the event next year by better incorporating student work in the program, Delage said, or running a datathon, for example. Some of this year’s participants have already volunteered to help with next year’s event. A full list of this year’s speakers at the WiDS Conference at NCSA is here. For more information about the global WiDS conference and ways to get involved, please visit https://www.widsconference.org. The MBDH is one of four regional Big Data Innovation Hubs with support from the National Science Foundation (award # 1550320), and works to build capacity and skills in the use of data science methods and resources in the 12-state U.S. Midwest Census region. Learn more about the Hub at http://midwestbigdatahub.org. Thanks to NCSA Public Affairs for contributing to an earlier draft of this post. “[W]hile we’re called the Big Data Innovation Hubs, we’re very focused on building capacity in data science, building expertise, access to data-related services and networks related to all things data science,” said Cragin. That means making available “to all kinds of communities” access to data-related skills, services, tools and opportunities, Cragin states. By developing public/private partnerships and working with groups to leverage these resources, the hubs can help coordinate solutions to “shared grand challenges,” she notes. The hub also is endeavouring to extend data science research and education to predominantly undergraduate institutions—including minority-serving institutions—to help add data skills for the developing workforce, she states. The regional aspect allows each hub to identify priority areas or “spokes” that they are pursuing. For the Midwest, issues relating to water quality; digital agriculture and unmanned aerial systems; and food, energy and water, among others, play a major role. Sustainable Cities’ team leader Ulrike Passe, associate professor of architecture, presented our hybrid physics data modeling framework at the National Science Foundation-sponsored Research Coordination Networking (RCN) workshop held at Carnegie Mellon University on May 17, 2018. The presentation, which capstones one of the major branches of the Sustainable Cities initiatives, demonstrated the integration of our recently developed thermo-physical data simulator with our research into human energy-use behavior to demonstrate how a more holistic neighborhood energy model could be constructed. This same model was presented by graduate research assistant Himanshu Sharma at the fifth High Performance Building’s Conference on July 9, 2018, at Purdue University. The Community Growers Program, a public-engagement initiative started back in March of 2017, has become another core pillar of the Sustainable Cities group research. Spanning a course of eight weeks, researchers worked with 22 leadership-minded youth in the Baker Chapter of the Boys and Girls Club at Hiatt Middle School in Des Moines, Iowa, to create a community garden based on a methodology of spatial, socio-technical storytelling. Through this process, the youth participants were able to learn more about their community through access to geographic information system (GIS) and spatial mapping tools. Associate English professor Linda Shenk, our community engagement lead, and Mallory Riesberg, a collaborator with the Baker Chapter of the Boys and Girls Club, presented this methodology in a presentation titled, “Fostering the Next Generation of Big Data Scientists and Sustainable City Planners” at The Growing Sustainable Communities Conference in Dubuque, Iowa, on Oct. 4, 2017. Team members Linda Shenk, Passe and Alenka Poplin, assistant professor of community and regional planning, would later be published in the 35th Journal of Interaction Design and Architectures for the inclusion of this work in their entry, titled, Engaging Youth with Pervasive Technologies for Resilient Communities. Poplin, an established researcher in the field of geo-spatial mapping, also leads a research group that seeks to understand how to better develop feedback loops through innovative user-interfaces. An inquiry into mapping places of emotional power was highlighted in a 2017 paper entry to the second edition of Kartographische Nachrichten on Empirical Cartography Journal, titled, “Mapping Expressed Emotions: Empirical Experiments on Power Places.” More recently, Poplin and her researcher team have begun testing an energy survey game they have developed called E-Footprints. The framework of this game includes the extraction of user-performance data to measure and analyze what learning opportunities may help guide more environmentally efficient decision making. This feedback is then generated back into learning mini-games throughout the game, such that the user gets more “energy savvy” as they play. This project begins field-testing in November 2018. With a diverse, multifaceted research team of nearly 50 members, the Sustainable Cities group continues to advance the capabilities of communities and cities to think sustainably about a better future. Read more about the MBDH’s Smart, Connected, and Resilient Communities initiatives. 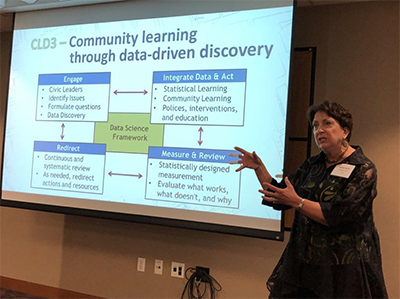 Recently, the American Statistical Association (ASA), with support from the National Science Foundation (NSF), hosted a two-day summit in Washington D.C. to discuss outcomes and curricula for data science programs at two-year colleges. The Two-Year College Data Science Summit (TYCDSS) was intended to help spur the growth of data science programs at these institutions and included representatives from two and four-year institutions, government, and industry. The working discussions provided an opportunity for the summit participants to discuss what was expected and feasible for a student from each category to complete. The discussions were captured by a designated writing group and there will be a forthcoming write-up summarizing the recommendations of the summit participants with guidelines for two-year college data science programs. This summit was particularly timely for my colleagues at Lansing Community College (LCC) as we have recently begun development of a data science program. Prior to the summit, participants were provided access to a list of resources that included relevant research, reports from related workshops, and sample syllabi. Of particular interest to us, as we design the layout of our program, were the Park City Math Institute’s Curriculum Guidelines for Undergraduate Programs in Data Science (2016) [PDF], the Oceans of Data Profile of the Data Practitioner (2016), and the Oceans of Data workshop report on Building Global Interest in Data Literacy (2016). The resources provided, candid discussions with other two-year colleges regarding their programs, and the discussions about realistic competency expectations were also of interest and informative to our program design. The intent of the TYCDSS directly supports the MBDH’s priority area of interest in data science, education and workforce development. Two-year colleges provide higher education accessibility to many students who could not or would not otherwise pursue an advanced degree. An increasing number of these schools are offering certificate and Associate’s degree programs in data science and analytics to support growing workforce demand. Growth in these types of programs should naturally lead to an increase in data competency, enrollment in university programs, and larger hiring pools for data science based careers. 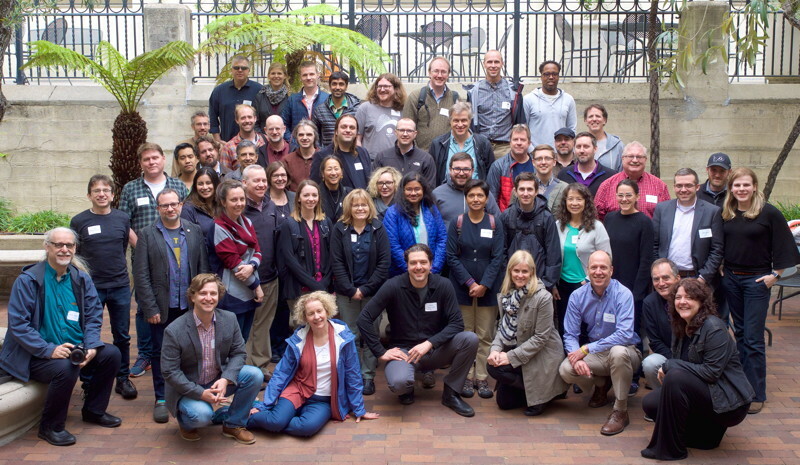 The NSF-funded conceptualization of a US Research Software Sustainability Institute (URSSI) is making the case for and planning a possible institute to improve science and engineering research by supporting the development and sustainability of research software in the US. Functioning of the individual and team: issues such as training and education, ensuring appropriate credit for software development, enabling publication pathways for research software including novel methods beyond “classical” academic publications, fostering satisfactory and rewarding career paths for people who develop and maintain software, increasing the participation of underrepresented groups in software engineering, and creating and sustaining pipelines of diverse developers. Functioning of the research software: supporting sustainability of the software; growing community, evolving governance, and developing relationships between organizations, both academic and industrial; fostering both testing and reproducibility, supporting new models and developments (for example, agile web frameworks, software as a service), and supporting contributions of transient contributors (for example, students). Functioning of the research field itself: growing communities around research software and disparate user requirements, avoiding siloed developments, cataloging extant and necessary software, disseminating new developments, and training researchers in the usage of software. Bring the research software community together to determine how to address the issues about which we have already learned. In some cases, there are already subcommunities working together on a specific problem, including those that we are part of, but those subcommunities might not be working with the larger community. This leads to a risk of developing solutions that solve one issue but don’t reduce (or might even deepen) other concerns. Identify additional issues URSSI should address, identify communities for whom these issues are relevant, determine how we should address the issues in coordination with the communities, and determine how to prioritize all the issues in URSSI. We are not working in a vacuum, but with other like-minded projects. In addition to Better Scientific Software (BSSw) and activities around research facilitators (ACI-REF) in the US, there are two ongoing institutes in science gateways (SGCI) and molecular sciences (MolSSI); a recently completed conceptualization in high energy physics (S2I2-HEP); two other conceptualization projects now underway in geospatial software and fluid dynamics; and a large number of software development and maintenance projects. In the UK, the Software Sustainability Institute (SSI), which has been in operation since 2010, is an inspiration and a potential model for our work. Given these existing activities, part of our challenge is to define how we will work with these other groups. For example, we might decide that they perform an activity so well that we should point to it, such as the SSI’s software guides. Or we might decide to either duplicate or enhance an activity they do to expand its impact, such as working with the SGCI to offer incubator services to a wider community than just gateway developers. Or we might decide to collaborate with one or more groups, such as on policy campaigns aimed at providing better career paths for research software developers in universities. We have held one workshop and are planning three more, in addition to a community survey we plan to have out soon, and a set of ethnographic studies of specific projects. We are communicating through our website, a series of newsletters, and a community discussion site. URSSI welcomes members of the research software community to join us, both to help us determine how to proceed and to directly contribute. Please sign up for the URSSI mailing list, contribute to our discussions, and potentially publish a guest blog post on the URSSI blog on a topic around software sustainability. Today we are launching a new MBDH Community Blog, which is intended to extend information sharing around events and projects, as well as expand our channels for Community conversation. 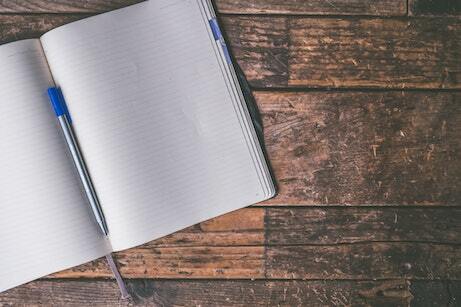 We plan to run 1-2 posts per month, and we are now seeking submissions from the MBDH Community – including the Spokes and our other collaborative projects – that describe your contributions and developments in the broader data ecosystem. Of interest are short reports and highlights from data-related meetings, events, or project outcomes, inclusive of the role and impact of the MBDH for these efforts. We welcome contributions from the Social Sciences and Humanities, including short contributions that address data and algorithmic ethics, or coming changes for work, daily life, and public engagement in U.S data policy. Our first guest post is by Daniel Katz, Assistant Director for Scientific Software and Applications at the National Center for Supercomputing Applications (NCSA). Check out his post on the US Research Software Sustainability Institute (URSSI) project. To create a robust strategic plan for the Midwest Hub. To plan toward long-term sustainability, especially financial sustainability, for the Midwest Hub. As always, please contact us with any ideas or questions.